Central Nebraska Exterior Home Improvement | Obermiller Seamless, Inc.
"We'll Go to Any Length to Beautify Your Home!" 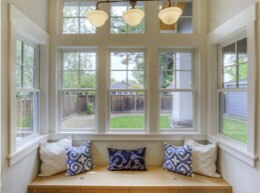 Whether you are replacing a few windows, undertaking a complete exterior home improvement project, or building a new home, Obermiller Seamless, Inc. can help. Call, e-mail, or stop in and see us at our new location at 719 West Anna Street in Grand Island, Nebraska. By the way, we still use the heaviest material available for gutters and also for our Seamless steel siding. After you select the color and style you want, the next step is for us to manufacture the siding. This is done on-site, at your home. We bring the factory to you! We have teamed up with EnerBankUSA to assist our customers in meeting their financial needs. Endless Possibilities to Beautify Your Home! At Obermiller Seamless, Inc., we know how important your home is to you and your family. In fact, for most people, their home is their biggest investment! That's why we offer a wide variety of services to help improve your home's look and functionality. From siding to doors to gutters and more, we love to exceed our clients' expectations, going any length to beautify your home. We even offer free estimates—simply fill out our form and a member of our team will contact you shortly.